A previous post, found here, looked at Stafford County Unionist Abraham Primmer. With the compensation he received from the U.S. government after the war, Primmer successfully returned to farming and lived out his final years as a respected member of his Stafford County community. “Bell-Air,” the house and property, remained a prominent landmark in the neighborhood that became known as Leeland after the war. The home and property remained in the hands of Primmer’s daughters until 1926. The house remained in good shape and was at its finest when a researcher from the Works Progress Administration visited the farm in 1937. By 1942, however, the county land assessment noted “building burned,” indicating that the house was gone. The farm, which became known locally as “Walnut Farm,” went through a number of owners in the last half of the 20th century. Most of them apparently purchased the property as an investment, as its location along the railroad made it an attractive piece of ground with much potential. The Virginia Railway Express stop at Leeland Station, just off the northern boundary of the property, made the land ripe for residential development. Park staff has recently been engaged in looking at Fredericksburg area’s Unionist families and the role they played in the Civil War hereabouts. Staff Historian Don Pfanz recently authored an article on this subject in the locally published Fredericksburg History & Biography (Volume 10). 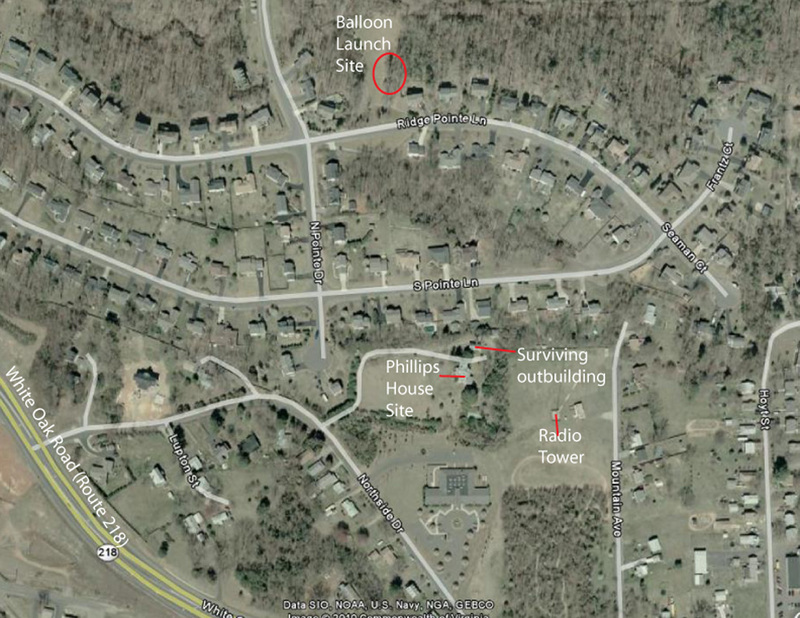 A two-part post on this blog last year, which can be found here, looked at the activity of perhaps the most active Unionist in Spotsylvania County, Isaac Silver. Today’s post seeks to introduce our readers to another of the local Unionist community who made hard choices about his involvement in the war, resisted Confederate authority and ultimately survived within a hostile environment. 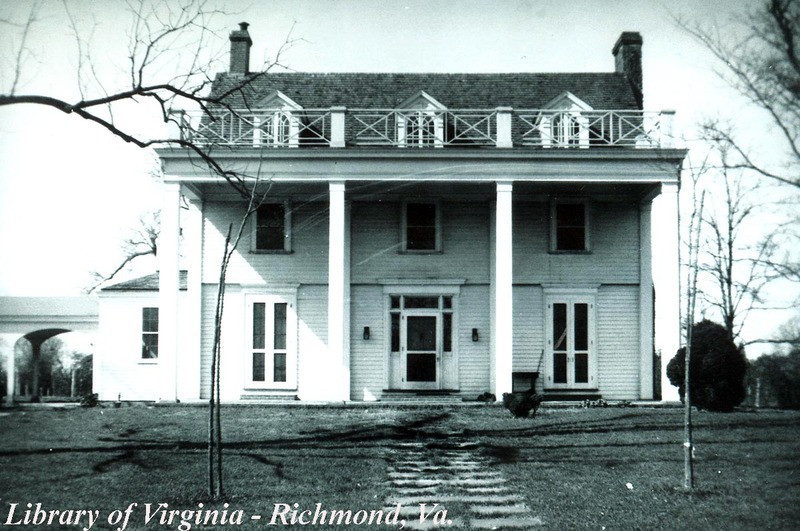 Abraham Primmer moved his family to Stafford County, Virginia in 1853, purchasing a 360-acre estate, known as “Bell-Air.” The property sat along the Richmond, Fredericksburg & Potomac Railroad about 1.5 miles northeast of Falmouth. Abraham hailed from New York and spent his early adult life in Chemung County, serving as a Supervisor and Justice of the Peace for the town of Catlin, as well as an assemblyman for Chemung. The family included Abraham and his wife Elizabeth, along with their four daughters and three sons. An 1867 map showing Abraham Primmer’s “Bell-Air” in relation to other landmark residences in southern Stafford County. On the subject of secession, the Primmers stood solidly behind the Union. Abraham later claimed that he “never drew a disloyal breath from beginning to end.” On May 23, 1861, Virginians gathered at polling places throughout the state to cast their vote on whether or not to adopt the Ordinance of Secession. Abraham remembered that at his polling location, militiamen were on hand, intent on making sure the ordinance received overwhelming support. 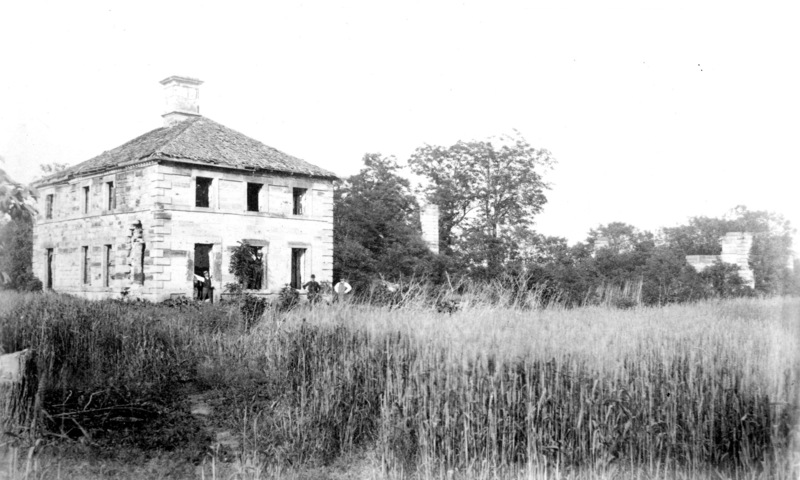 Susan Alsop’s house, which burned in 1901. Yesterday I received a call from a former Spotsylvania resident, Jose Brown, who grew up near the site of widow Sue Alsop’s house. He pointed me in the direction of a brief article in the Fredericksburg Free Lance that chronicled the horrible fire there that left a young boy dead and destroyed Sue Alsop’s farm. The boy’s name was Eddy Scott, the son of Edmund Scott, who Jose always understood to have been one of Susan Alsop’s slaves. The slave census for Spotsylvania does indeed show that Susan Alsop owned a young boy slave, age 3 at the time of the census in 1860. ﻿ The Spotsylvania census for 1900 shows that Edmund V. Scott was born in 1858, and his son Eddy in 1891–still living within a stone’s throw of Susan Alsop’s house (indeed the article says that young Eddy lived WITH Sue Alsop). He was one of four children in the household. This is from the Free Lance of May 1, 1901. 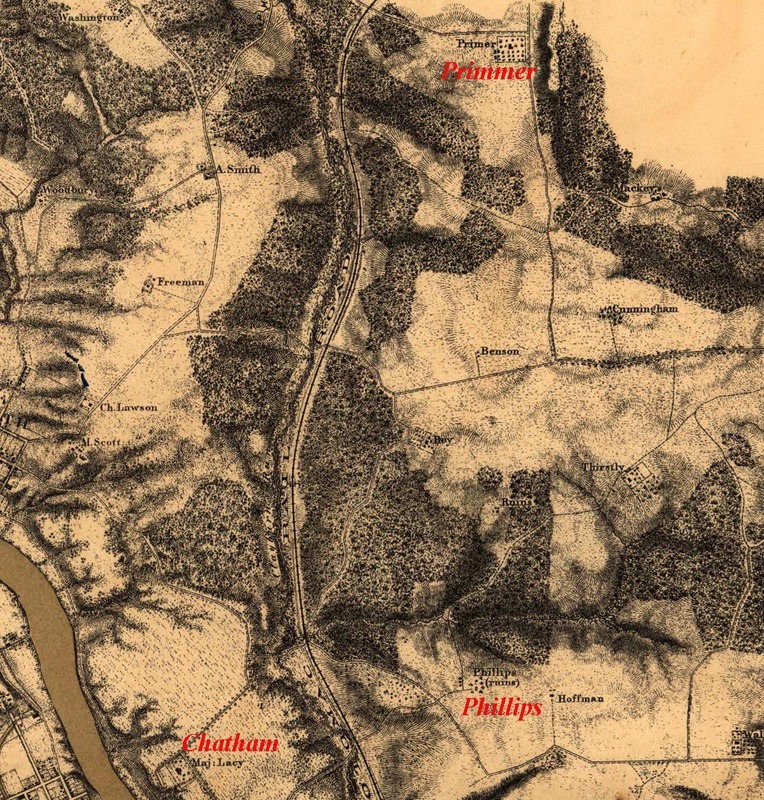 A young colored boy, son of Edmund Scott, who lived with Mrs. Sue M. Alsop at her home “Clover Dale,” about eight miles from this city in Spotsylvania, was in a chaff pen looking for hens’ nests, Tuesday evening. He lighted a match to find the nests. A spark ignited a the chaff and he was burned to death. The flames quickly spread to the barns and other out-buildings, which were soon destroyed. Then the fire reached the residence and it, too, was burned to the ground. Some of the furniture was saved but in a badly broken condition. Mrs. Alsop was not at home and there was no lady on the place except Miss, Ella Parker, a companion of Mrs. Alsop. The residence is insured with the companies represented by A.B. Botts & Co., for $2,300. The kitchen $200, and furniture $500, and the barns and outbuildings were insured with C.C. Rowlett & Co. for $600. The loss is over $8,000. My thanks to Jose Brown for sharing what he knows. 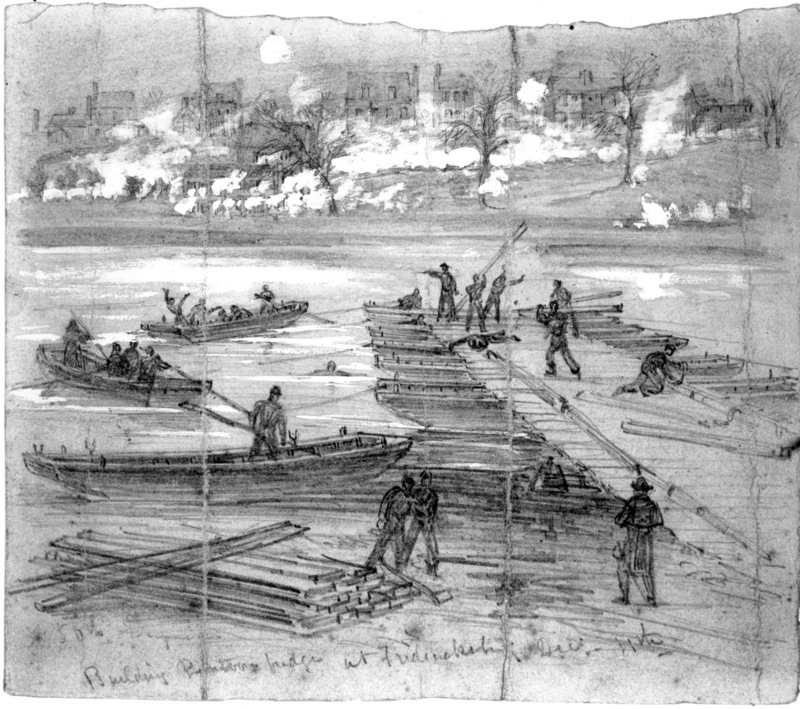 On this the 148th Anniversary of the bombardment of Fredericksburg, I thought it might be timely to revisit a post we did back in April on battle damage in town. Today, few visible examples of external battle damage survive in Fredericksburg. I am aware of only a few buildings that show it, and then only subtly. It’s a different story on the interior of buildings in town. Probably dozens still bear scars, and many owners consciously preserve the evidence of battle. The Baptist Church has spectacular damage in its steeple; the courthouse bears scars, as does the Rising Sun tavern–both in their roof structures. One of our hopes is to do a photographic inventory of all the battle damage in town, and perhaps even some online videos that document some of it. More on that another day. The upper pontoon crossing, below Chatham--at the base of Hawke Street. At the height of the Union bombardment on December 11, as many as 100 shells a minute exploded over town (so says E.P. Alexander). It’s likely virtually every building in town suffered some damage. A search of tax records indicates about 100 taxable buildings were either destroyed or so heavily damaged that they had to be pulled down–about 10% of the town. Bear in mind that not all these buildings were destroyed by Union fire. The Confederates fired into town too over the next four days; I would estimate that about one-quarter of the town’s damage came from Confederate guns, and on the outskirts of town, below Marye’s Heights, the vast majority of damage came from the Confederates, as Russ Smith pointed out in the discussion of the Sandy Bottom image the other day. 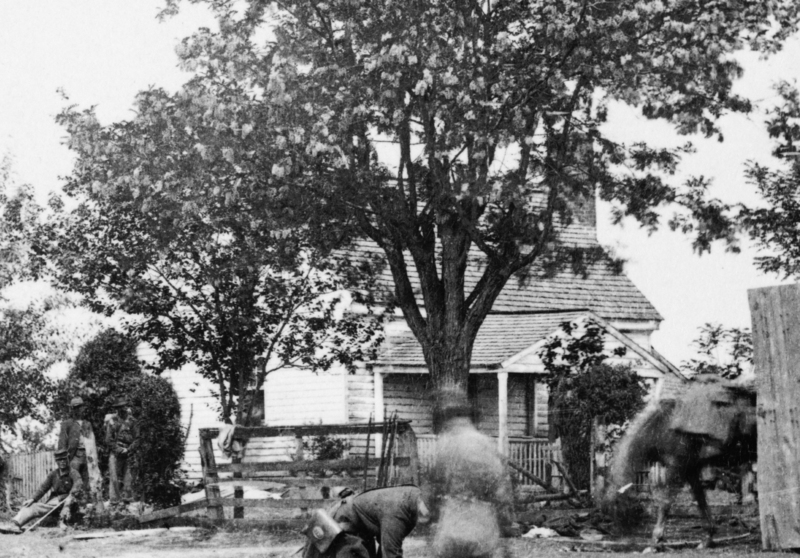 Accounts of the destruction are vivid, but in fact photographers who came to the town in 1863 and 1864 recorded few images intended to document it specifically. Four images are known, including three images taken on lower Caroline Street–one of which I include here (this is of 136-138 Caroline, which still stands in one of the most desirable neighborhoods in town). 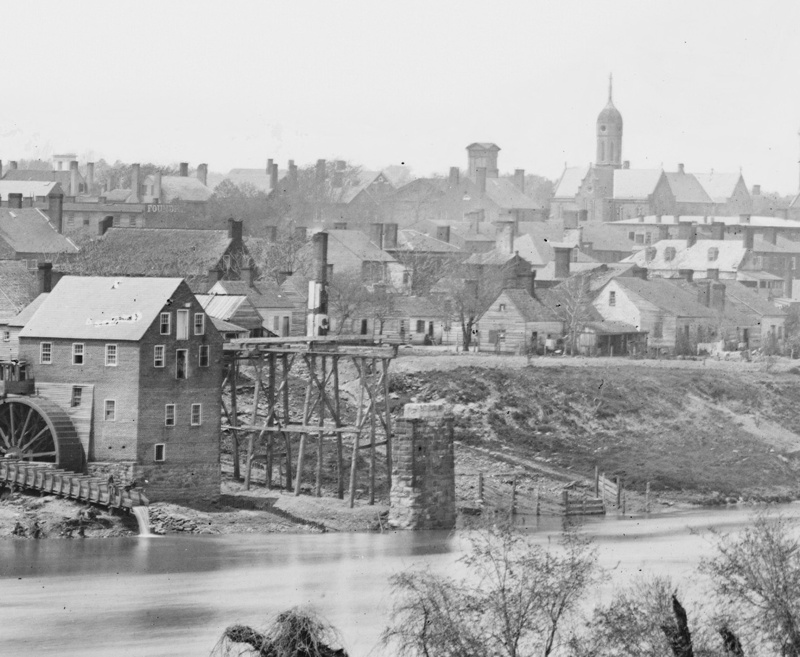 Despite the photographers’ inattention to battle-damaged buildings, a close look at some of the many panoramic images begins to hint at the extent of the destruction in Fredericksburg. Take, for example, this blow-up from the now-familiar panorama taken from just below the ruined railroad bridge. From John Hennessy (click here for a short prior post on an artifact from Mannsfield). 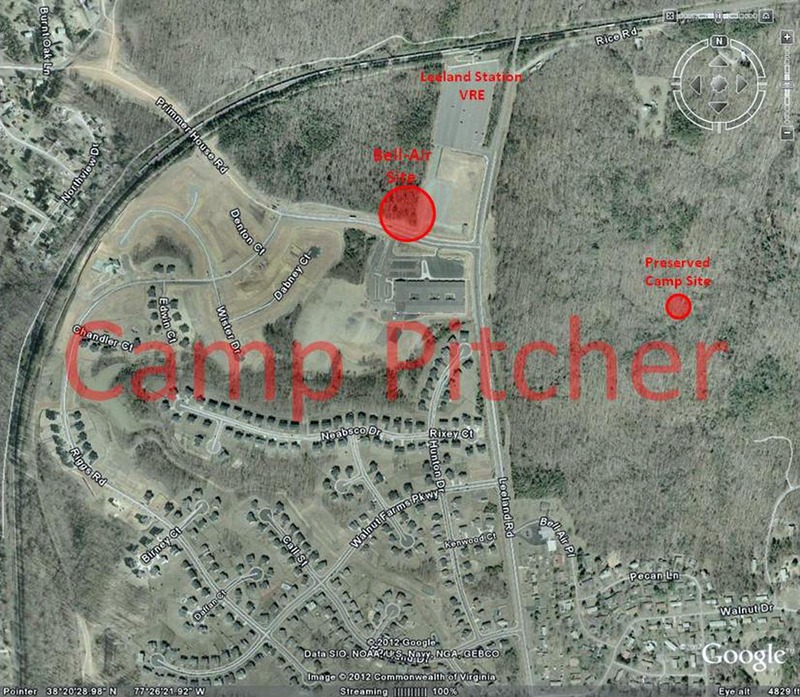 Information on Mannsfield’s location and current condition is at the end of this post. Please remember that the site of Mannsfield is on private property and not accessible to the public. Spotsylvania has been particularly hard-hit by the loss of historic homes over the decades. In some areas, you can travel miles without coming upon an antebellum home–this on a landscape that was once liberally dotted with them. Some succumbed to war, more to neglect. And a few disappeared to the bulldozer’s blade. Of all those that have vanished, none in its day shined more brightly than Mannsfield. The remains of Mannsfield, probably in the 1870s. The ruins of the big house are at center; the north wing at left, and the south wing on just on the right edge. These ruins stood until the 1920s. It stood about two miles south of downtown Fredericksburg, on the banks of the Rappahannock River. Mannsfield is today most famous as the site where Union general George Dashiel Bayard was killed at the battle of Fredericksburg–he was mortally wounded in he front yard and died just four days before what was to have been his wedding day. But, in fact, Mannsfield was probably the most impressive antebellum plantation in the Fredericksburg region, and one of the oldest, too. It was built in 1765-1766 for Mann Page III,* and it was close to being a literal copy of Richmond County’s Mount Airy, where Page’s mother grew up a Tayloe (the only major difference I can see is the design of the riverside entryway–otherwise the places seem to have been identical; Mount Airy still stands). Page was the Fredericksburg region’s first congressman, selected to the Continental Congress in 1777, at age 28. He died in 1803 and is buried in the nearby family cemetery–the only surviving feature of the Mannsfield complex. Stuart Barnetts romantic vision of the west (front) facade of Mannsfield, showing the main house and wings. The house was anything but understated, built of sandstone blocks with two advanced, detached wings linked to the main house by a circular covered walkway. In the main house was nearly 7,000 square feet of living space, plus an elaborate basement. By the time of the Civil War (when Arthur Bernard owned it), thirty outbuildings sprawled across Mannsfield’s 1,800 acres (one of the biggest plantations around), including a stable, corn house, machine house, three barns, dairy, garden office, pump house, meat house, three poultry houses, ice house, a private owner’s stable, carriage house, overseer’s house, blacksmith shop, tobacco house, and six slave cabins (the site of some of these cabins, which in 1860 housed some of Bernard’s 77 slaves, is in the park off Lee Drive). Mannsfield’s prominence guaranteed it got attention in both peace and war. Washington reputedly visited here; so too did Union luminaries in 1862. 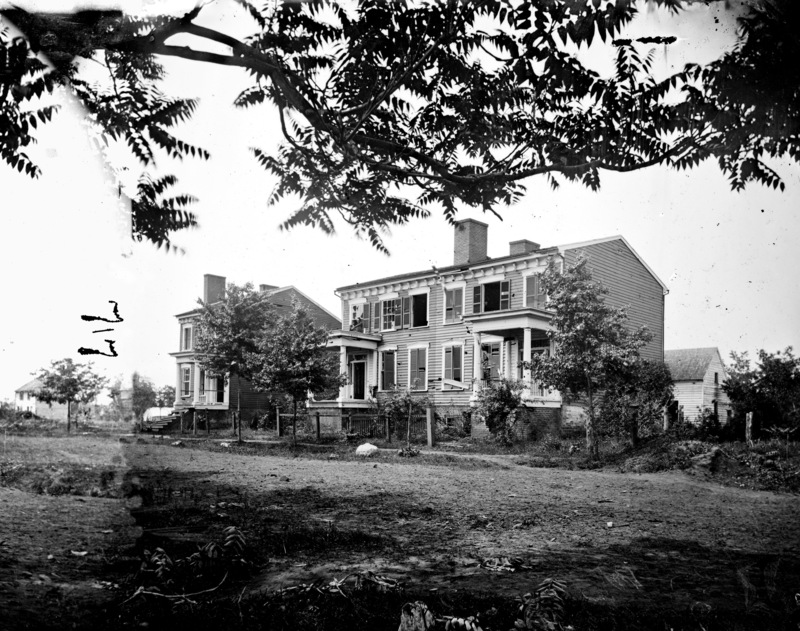 For long stretches of 1862 and 1863, the house was in Confederate hands. Indeed, it was by the hands of Confederate pickets that the big house burned, accidentally, in early April 1863. 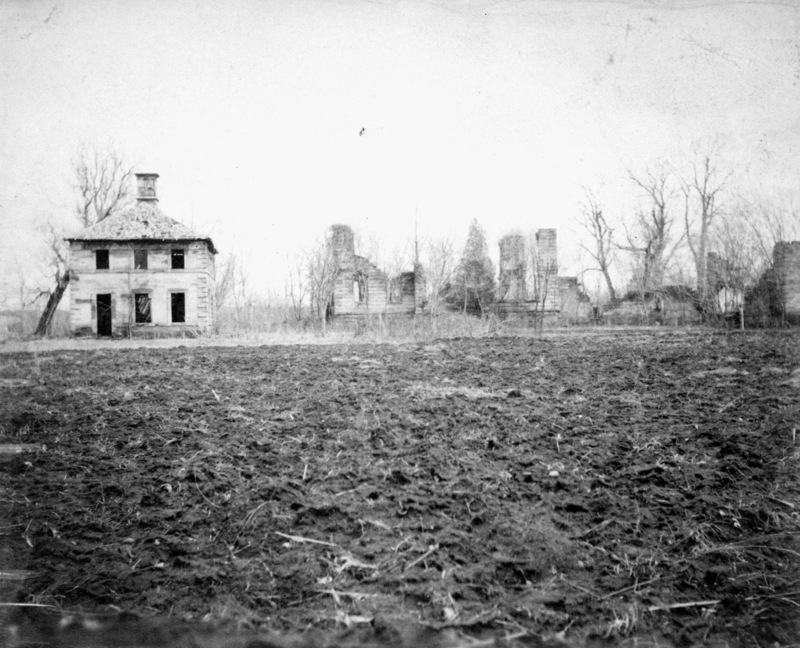 The standing ruins, looking at the west facade--looking southeast likely in the 1870s. The north wing is at left, the ruins of the big house faintly visible at center, and he remnants of the south wing at right. The ruins of the main house and the decaying remnants of the wings stood for six decades, until the early 1920s when artist Gari Melchers of Belmont acquired the accessible stone from the then landowner, R.A. James. According to local news reports, Melchers used stone from Mannsfield to build his new studio on the grounds of Belmont. Some of it also ended up in local buildings, like this one on Virginia Ave–near upper Princess Anne Street.